It was entirely predictable (last five paragraphs). Now, when we are making our requests of HKB"H today, let's ask that He make Trump's plan as successful as Haman's, y"sh. But, this time, with open and revealed miracles! No more hiding!! Sugar, sugar and sugar! A lot of empty, nutritionless calories. With the invasion of western culture into the Jewish State, this is the kind of mishloach manot that can be seen all over at all the shops in Israel. I'd like to encourage all my readers to resist the temptation to buy these ready-made baskets and invest some time, effort and imagination into creating healthier versions, perhaps something more in keeping with our time-honored traditions. There is a mitzvah to send one gift called Mishloach Manot, consisting of two foods, to one person on Purim. After fulfilling one Mishloach Manot according to the halacha, one may give more even if they don’t fulfill all the stringencies of Mishlaoch Manot. Anyone who increases in sending Mishloach Manot is praiseworthy. Some explain that we’re supposed to give gifts in order to increase friendliness and spread kindness and peace among Jews. Others explain that the obligation is meant to supply people with food for the Purim Seuda especially those who are poor and are embarrassed to ask for money. 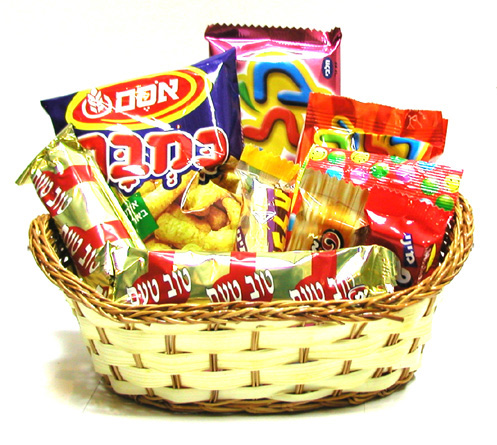 Mishloach Manot should be given during the day of Purim and not the night. It is preferable to give it before eating the Seudat Purim. 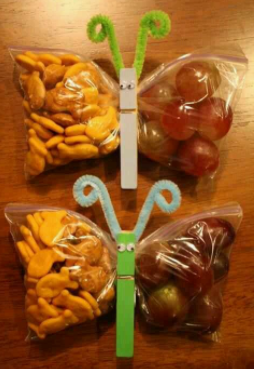 The food being sent should be cooked or ready to eat,.... Canned food is considered ready to eat and is acceptable. ...Many say that each food should be something that could serve as a course in a meal. If one sends bread it counts as one food and only one other is required. ...A drink counts just like a food, but some are strict to give two foods. Tzom Kal and a very happy Purim to all! See Our Orphaned Generation by Donny Fuchs. Introducing Rabbi Lawrence Hajioff. According to his Wikipedia entry, he is an English American rabbi, educator, and writer. He is on the Judaic studies faculty of the Stern College for Women at Yeshiva University and is also the Assistant Director of Admissions. Hajioff served as the official rabbi for Birthright Israel in Manhattan, New York. Hajioff is also the author of three books: Jew Got Questions? (2014), Will Jew Marry Me? : A Guide to Dating, Relationships, Love and Marriage (2016), and The Future: A Guide to the Jewish Messiah, Israel, and The End of Days (2018). He has several excellent shiurim on the subject of Mashiach at his Youtube channel, like the one posted below and also, an entire series on Megillat Esther, as well as many more. It's all in the hands of HKB"H. But, what if all these preparations are His hand? ...In total, some 4,500 soldiers from the two militaries will take part in the exercise — 2,500 of them from the United States’ European Command (US EUCOM) and 2,000 from the Israel Defense Forces. This is a substantial increase from the 2016 exercise, in which some 3,200 soldiers took part. The Juniper Cobra exercise is scheduled to begin on March 4 and will formally run until March 15, though some American troops will stay in Israel and continue training with the IDF until the end of the month, the army said. ...On Monday, a top IDF general warned that this year was more likely to see war break out between Israel and the Iranian-led axis of Tehran, Damascus, and the Beirut-based Hezbollah terrorist organization — all three of which have called for Israel’s destruction — as the trio’s victories in the Syrian civil war will allow them to focus their attentions on fighting the Jewish state. “The year 2018 has the potential for escalation [of military conflict], not necessarily because either side wants to initiate it, but because of a gradual deterioration. This has led us to raise the level of preparedness,” Maj. Gen. Nitzan Alon, head of IDF Operations, told Army Radio in a rare interview. Satellite images by Israeli company ImageSat International this week showed the fifth generation jets — two Su-57 fighter aircraft — at Russia’s airbase in the coastal Syrian city of Latakia. A source in the defense ministry confirmed to RBK news agency this week that the two planes were sent to the Hmeimim base “for a test in real conditions.” The jets are said to be a potential rival to the US’s Lockheed Martin F-22 Raptor, which American forces use in patrols over Syria. Government sources in Moscow reported Saturday, Feb. 24, that four fifth-generation Sukhoi-57 jet fighters are currently deployed in Syria after a second pair landed Friday. Does Putin intend to order his mighty airborne strike force to go into battle against the US or Israel in the boiling Syrian arena? If he does, he will be launching the first contest between the most sophisticated warplanes ever devised for a test of superior might between the US and Russia and a war escalation unprecedented, even in Syria. Meanwhile, nothing like provoking HKB"H with yet another graven image on holy soil and one representing the Christian man-god no less! This lion will be a gift from American Christians to the Jewish state in honor of its 70th anniversary as a modern nation. ...The large than life, 105 percent size is based on the dimensions of the largest male lion ever known. An additional 5 percent was added for God, according to the Christian sculptor and evangelist. This is, of course, in keeping with Christian tradition and "Lion of Judah" is a popular appellation for JC of Nazareth. Hashem yerachem! I'm not here to tell you how to think. I'm here to provide you with "the other side of the story" so you can make a well-informed decision about where you stand on certain issues - no matter which way you choose to go. Cyberspace seems to be curiously heavily weighted in favor of only one side at the moment. Today is both the birthday and the yahrtzeit of the holiest and most humble man who ever lived - Moshe Rabeinu. This status is attested to by the very fact that no cult of personality ever developed around him. Baruch Hashem! HKB"H saw to that. Nothing would have grieved him more. The most extreme examples of the cult of personality are, of course, Christianity and Islam, which became world religions built around the figures of Yeshu and Mohammed. Unfortunately for us, we see quite a lot of this sort of thing in the Jewish world today. The lower the generation goes, the more cults seem to develop, r"l. The most well-known and visible examples of this in Judaism today are Chabad and Breslov. It would seem that Hasidism is particularly prone to developing cults of personality. But, perhaps that is because it started out as such, centered as it was around the person and teachings of the Ba'al Shem Tov. That is not at all to say that there are not good and valuable lessons to be learned from the Besht or other Hasidic teachers, but one must be aware and on guard against the negative side of it as well. Hasidism only developed in the mid-18th century and was bitterly opposed by many of their fellow Jews from its inception, including leaders of the generation like the Vilna Gaon. The Hasids themselves came up with the term Mitnagdim (opposers) to describe those who objected to the new and controversial movement. ...A public letter from the Jewish community of Vilna, bearing the signature of the Vilna Gaon, is the first document included in Zemir ‘aritsim ve-ḥarvot tsurim. It appeared shortly after the Passover festival of 1772, and accused Hasidim of a variety of religious offenses, focusing in particular on the allegedly phony and supercilious nature of their displays of piety—characterized by ecstatic prayers, recited in unsanctioned, breakaway synagogues, that included twirls and somersaults—along with their dancing, smoking, and drinking. Generally, the ban that was the subject of this letter condemned what was deemed as the Hasidim’s inappropriate, irreverently joyful demeanor in the service of God and their disregard for Torah study and disrespect for rabbinical scholars. All this stood in sharp contrast to the ascetic, dour, and severely scholarly demeanor of the Gaon and his disciples. The main reason that Hasidism ultimately made far fewer inroads into northeastern Europe—western and northern Lithuania in particular—was the enormous and enduring influence of the Vilna Gaon in that region, and the attribution to him of the fiercest opposition to the new movement. If you find yourself uncomfortable with much of Hasidic teaching or practice, you are not without a prominent leg to stand on. But, the best proof of my contention that it is based primarily on the cult of personality is the fact that no one is allowed to question any aspect of the movement and no criticism is allowed. To even suggest that one is opposed to anything about it results in being utterly and completely cut off with no further contact. What is happening now with regard to Breslov Rabbi Eliezer Berland is another example of what I term the excesses of Hasidism related to the cult of personality. I have been urged by a few people to make some statement on this matter via my blog. As a response to this urging, I will enumerate my concerns. The charges brought against this rabbi are extremely serious and they come from several women from within his community. The rabbi is reportedly on tape confessing his crimes. The rabbi ran all over the world to escape extradition when he was originally only wanted for questioning. At the same time, I am unaware of any rabbi of standing speaking publicly against him. Therefore, I take no position with regard to guilt. I'm not on a beit din and have not been made privy to the testimony of witnesses, so that's not my place. However, I have heard his defenders claim that he "falsely confessed' in order to preserve his life. I find two problems with that: 1) where is the great Tzadik's faith that his fate and his healing is ultimately in Hashem's hands, and 2) what about the halachah that one is obligated to give up his life rather than create a public desecration of God's name? Is it possible that a man on the exalted level that is claimed for this rabbi could really have been coerced into making a false confession? Thank God, I do not feel the need to answer these questions. I have rabbis whom I consult regarding questions which directly impact my life, but I have no need for a "Tzadik" to be my intercessor with HKB"H.
I keep a distance from all things Hasidic in any case because of its history and because of what I see from its representatives. I didn't escape one cult just to fall in with another. It is my personal opinion that any benefits it might have had to offer are far outweighed by the problems it presents. One can be a Litvak and experience every bit as much joy and devekut with HKB"H without the controversial baggage. One thing I am certain of in my own mind. Mashiach will not be someone who runs all over the world to escape answering criminal charges that have been brought against him, deservedly or not. And I can't imagine what kind of Mashiach he would be if he falsely confessed to crimes he did not commit in order to obtain medical treatment. I'll close this subject with a general warning which appears to be in order. Do not be impressed by miracle healings, miracle blessings and miracle results to prayers. ALL of these can be accomplished by fakers, because "...the Lord, your God, is testing you, to know whether you really love the Lord, your God, with all your heart and with all your soul." This is the week of Parashat Zachor: "Remember what Amalek did to you on the way." But, it's not enough to remember what Amalek did. We have to also remember why he was successful against us. You followed me in the wilderness in a land that was not planted (Yirmeyahu 2:2) – The Sages explained: This [the complete dependence on G-d that characterized Israel’s existence in the desert] is only temporary and will last only as long as you are on the way [to the Land of Israel] and until the Torah is permanently implanted within you. Afterwards, you shall enter the land which is My place, and you will plant at the time of planting, sow at the time of sowing, and harvest at the time of harvesting, and I shall grant you bounty greater than any other nation or land. However, the imperative to remove all traces of idolatry and to serve only G-d—this is incumbent upon you now and for generations to come. Have you removed the foreign gods from your midst? Have you brought yourselves under My wing and shattered all of your idols? Let Amalek come and examine you. If your hearts are completely with Me, you have nothing to fear. But if there is among you a man or woman whose soul still clings to the idols of Egypt and their abominations, let them [the idols] come and save you from the wicked Amalek! The verse therefore states: And Amalek came (Shemos 17;8)…and he tailed after you [striking] all the weak who fell behind (Devarim 25;18). After he tailed after you—R. Nachman explained: All those whom the “protective cloud” cast out were caught by Amalek. The Sages explained: This refers to the tribe of Dan who were cast out by the “protective cloud” because they were all idol-worshipers. The idol which Michah had created was in their midst, and there were many among them who had not wholeheartedly resolved to serve God alone (Yalkut Shimoni, Parashas Ki Setze). The complete obliteration of Amalek will occur at the time of the final redemption, immediately preceding the month of Nisan. A trace of that obliteration is felt each year during Purim, which falls in the month preceding Nisan. The reading of Parashas Zachor was therefore prescribed for this time of year. And sinners among our people have allied themselves with idolatry at the center of power in our country, davka now, this week before Purim, Parashat Zachor, in the shadow of the threat of war with Amalek. May all the enemies of God and Israel fall, never to rise again. ...Samaria residents were astonished to discover Monday night that the Arab village of Baita had posted on its Facebook page that the IDF had informed them ahead of time about the evacuation of the Evyatar outpost, News 0404 reported. Evyatar was established in April 2016, near the Tapuach junction, by some 50 families, in memory of Evyatar Borovsky HY’D, who was stabbed to death at the Tapuach junction five years ago. Amazingly, Monday night the outpost was evacuated, which suggests the IDF move had been coordinated with the village that produced the very murderers of Evyatar Borovsky. The evacuation of seven homes was violent, and three Jewish residents – while the murderers looked on. Have they become so inured to the fact of these "uprootings" that they are only "shocked" that it was done with so little compassion and regret? Do their ears even hear what their mouths say??? Does a "friend" (not to mention a "brother") violently uproot a person from his home??? I call on these people to reclaim their lost minds and return to sanity!! Those who come to uproot are also the enemy. Do not be shocked or surprised when they make common cause with those who do not appear in the guise of friendship or brotherhood. The resulting separation that this brings about between Jews and gentiles is what saved us during this season of time on two different occasions. The two "Peh" holidays - Purim and Pesach - feature the drinking of wine prominently in their narratives. In Egypt, we kept our language, our Hebrew names and our distinct mode of dress, remaining separate and apart from the Egyptians, hence we merited to drink the four cups of wine at the Pesach seder. On the other hand, in exile in the Persian Empire, the Jews sat and ate and drank wine in the presence of King Achashverosh and his nation at a grand banquet and were nearly destroyed as a result. Now, every Purim, when we sit and drink wine in holiness with our fellow Jews at the Purim seudah, we are making a tikun for that sin of mixing with the gentiles and drinking wine with them. With this in mind, it is no mystery why the ovdei avodah zarah of Hayovel attached themselves davka to the wineries of Eretz Yisrael. Their stated goal from the very beginning was to eliminate the separation between Jews and gentiles. 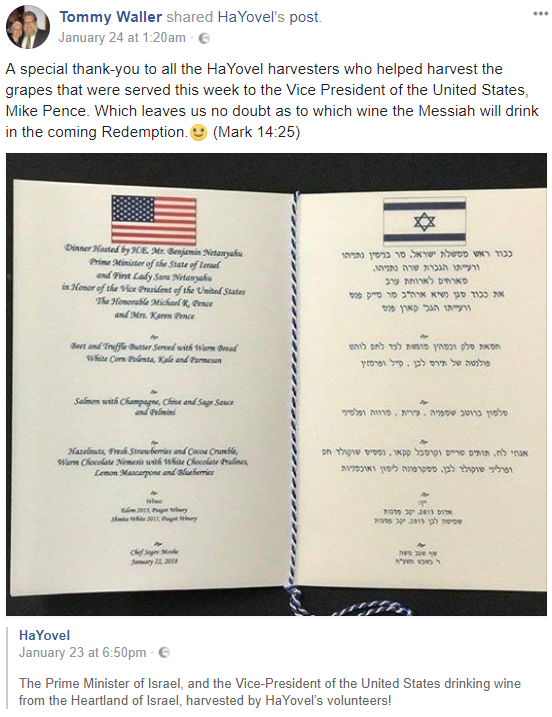 As admitted and even admired by one Jewish writer: "As a group of Christian Zionists, Hayovel acts as a bridge between the two religions in a totally unprecedented manner,...."
Further to the wine, their idolatrous worship of the man-god Yeshu is indivisible from their volunteer work davka in Israel's vineyards! HaYovel Ministries has designated "worship leaders" to guarantee that "praise and worship" is ongoing continuously in the vineyards during the working period. Volunteer Nate Taylor: "A group of worship leaders who have taken different times throughout the day to make sure that there's continuous praise/worship and prayer throughout the vineyards. These vineyards belong to our Abba (God, the Father) in that our praise and worship is an important part of that cycle to recognize who Ha-Shem is. I believe it does motivate and encourage others, not only to work harder and faster, but they're not even thinking about that, they're thinking about how we praise Ha-Shem throughout the day, not only with our words and our lips, but with our actions." I have drunk the wine from the hills of Samaria. That is the wine that, one day, the Messiah will drink at the great reunion in Jerusalem for all His Believers!! ...What if you were among the workers, who picked the grapes, of the winery from which the Messiah picks that big bottle of wine??!! The WINE is a running theme with them in their end times vision, right up to the present day. May all the true Jews merit to do teshuvah and present themselves a pure and holy, completely separate nation to HKB"H, especially at this season which mirrors our redemption. When Adar comes in, joy is supposed to increase, but this being the tenth anniversary of the Mercaz HaRav Massacre clearly indicates that is not always the case. We can only count on such things when we are being all that we can be. The following shiur by Rav Yehuda HaCohen Richter of Elon Moreh points out where we are lacking. It's up to us to make the necessary corrections to insure that Klal Yisrael will indeed see only happy times in the month of Adar. The only solace this generation is assured is that once we have hit rock bottom, and we're pretty close now, the only way left to go is up. "Who Will Survive When the Mashiach Arrives?" "What Kind of Mashiach Will We Have?" Anyone who knows Torah, knows that we were commanded to remove the indigenous inhabitants of Eretz Yisrael upon our entry into it, to settle it. Speak to the children of Israel and say to them: When you cross the Jordan into the land of Canaan, you shall drive out all the inhabitants of the land from before you, destroy all their temples, destroy their molten idols, and demolish their high places. You shall clear out the Land and settle in it, for I have given you the Land to occupy it. You shall give the Land as an inheritance to your families by lot; to the large, you shall give a larger inheritance and to the small you shall give a smaller inheritance; wherever the lot falls shall be his; according to the tribes of your fathers, you shall inherit. But if you do not drive out the inhabitants of the Land from before you, then those whom you leave over will be as spikes in your eyes and thorns in your sides, and they will harass you in the land in which you settle. And it will be that what I had intended to do to them, I will do to you. No one can say this only applied to some previous ancient time as we see clearly that it has come true with 100% accuracy in our time - terror attacks from every direction; the expulsion of entire Jewish communities; and the wanton destruction of Jewish property. However, a situation has developed here for which there can be no excuse and no explanation. Why have we allowed unethical people to bring in idol-worshipers from outside our land and make a home for them among us??? By our silence and inaction, we have compounded the problem many times over! How Much Trouble Can Be Caused by "Unfaithful Men"? And it is so much worse today than it was in 2009 when the above was originally written. The Divine Presence is pushed away by all these impurities and so our Divine protection is diminished accordingly. 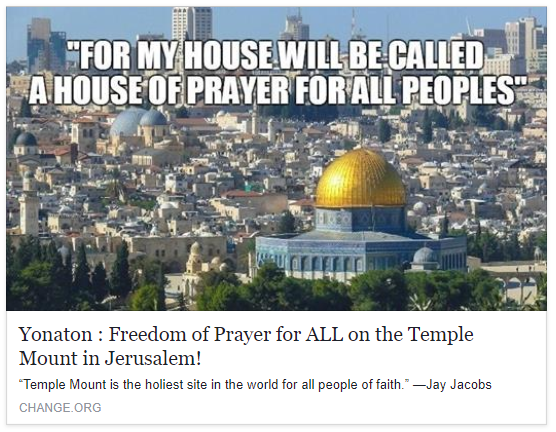 And as if that were not enough, to add more insult to injury, there are voices growing louder and louder, every day, to bring this idolatry right up onto the Temple Mount! We have to weep for all the terror that we have brought upon ourselves because Rabbi Itamar Ben Gal, Hy"d will not be its last victim. That is guaranteed as long as we continue to defy God's Law. This is the time of the great birur - the time during which it will be decided who will go with Mashiach into the messianic age and who will be separated out as traitors and rebels against our Holy Torah. The time is coming when Mashiach will lead us to fulfill the Law in all its details. Will you be eager to follow him or will you try to stand in his way? Yesterday, I mentioned Michelle Bachman in a blog post about the Israeli government's complicity in missionary activity here in Israel. It was reported that she was present at the inaugural joint "Bible-study" between Christians and Knesset Members last October. The following video is instructive about who and what is really behind this push to ensure Christians' freedom to missionize in Israel. If you, as a Jew, are not shocked, appalled and repelled by this, then there is no hope for you. Interestingly, Rep. Franks was forced to give up his Congressional seat last week in the wake of "credible claims of misconduct." Now that former Kansas Governor Sam Brownback has been confirmed and sworn in as the new US Ambassador for International Religious Freedom, it will likely be impossible to arrest the tsunami of missionary activity that is flooding the supposedly Jewish State. The Torah forbids the practice of avodah zarah in Eretz Yisrael, i.e. it does not advocate "religious freedom." In fact, Christian missionizing is strictly forbidden by the Torah. But, are any of us so foolish as to believe this Ambassador for International Religious Freedom will support Israel's right to ban the practice of Christian worship of its man-god idol or its insidious spread across our land in accordance with our own deeply held religious beliefs? They are being very open now about their intentions because they think their time has arrived and that this White House is in their pocket. HKB"H will have the final word in this matter and we already know who wins in the end. Is Education the Ultimate Answer? Some people think our government leaders simply need to be educated about the missionary threat to Israel and that will solve all of our problems. They seem to think the leadership is unaware of what is going on. Well, they are getting an education alright - from the Dominionist element that is taking over in Israel. 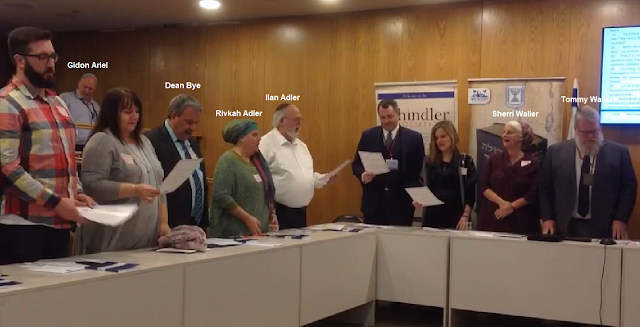 Thank you for praying for us toward Sunday 15 October  as we hosted the opening ceremony of a monthly Bible study in the Knesset, the only Bible study of its kind with Israel’s government leaders (Cabinet Ministers and Members of the Knesset/Parliament). ...Speakers included Pastor Jim and Rosemary Schindler Garlow, US Congressman Trent Franks, US Congresswoman Michele Bachmann (soon to lead worship and prayer in the United Nations in partnership with Skyline Church), and Daniel and Carol Ketchum. As Carol and I spoke, we listed twelve reasons why God called us to move to Israel. We distributed to each attendee 485 Bible references from Hebrew Scriptures. By their own admission, they are missionizing in Israel! And these missionaries are meeting monthly with at least 50 Knesset members to study the "Bible"! Hashem yerachem! The Israeli leadership is not clueless as some imagine. They know exactly what is going on and they not only approve, they celebrate its success!! There is no way that they are "unaware of the problem." They are the enablers of it! From the very beginning the missionaries were invited in by the government itself. Obviously, education is no answer to this existential problem. In the name of democracy, missionary activity in the "Jewish" State is protected by law! Beware False Teachers Bringing the World "Religion"
I put "religion" in quotes because all the "enlightened" people are down on religion. Today, it is all about "spirituality" because religion divides us, but spirituality unites us. So they claim. Some of the rabbis teaching on the internet are agents of the Vatican's effort to create a world religion, wittingly or unwittingly. Maybe they have also been mislead and think they are revealing a new truth to the world. Again, timing is everything. I'm sure that Mashiach will reveal to us deeper truths from the Torah than have been known before, but that will only come after our bodies and minds have been upgraded post-geulah shleimah, when the yetzer hara has been externalized once again and we regain the level of Adam before the cheit. Again, the failure to WAIT - in Gan Eden as well as at Har Sinai - was the failure of these two great tests. This same test is facing us now. DO NOT ALLOW YOURSELF TO BE MISLEAD. DO NOT FAIL THIS TIME. Caution: If your faith is shaky, do not listen to this video. God forbid that what I share for instructional purposes should mislead anyone down this path to perdition. You should be able to pick out the obvious errors. Prepare yourself, warn others. NWO vs MESSIAH --- Rabbi YUVAL OVADIA -- AMAZING!! General of the Society of Jesus (Jesuits), aka "The Black Pope." We have to look at the world as it is, not as we might like it to be. Talk about "negativity." Well, that all depends on how you define "negativity." Hamevin yavin.